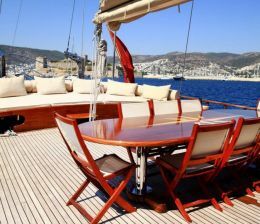 Turkey has long and successful background in yacht building industry from generations. Our grand fathers to build a large wooden gulet used to take 3 to 4 years to complete and launch Nowadays any size of boat can be sea trial ready in 12 to 18 months from the date the keel being laid. we have recently built a 24 meters length first class quality Turkish gulet with four cabines in three layers of laminated wooden and two layers of epoxy fiber and she has been completed in 12 months only. We can guide you to build your dream yacht from a reputable naval architect design to final construction either from marine grade high tensile steel, marine grade Aluminium, grp or epoxy laminated mahogany with your own taste, design and choice of interiors with the best contruction materials and furnitures available in the market in order to deliver a unique yacht with glossy finish. With years of existence in yachting industry we build motoryachts, luxury gulets and performance sailing yachts in our own and also subcontracted boatyards located in Fethiye, Marmaris, Bodrum, Antalya and Istanbul. State of the art technologies are being used to build modern custom made yachts which we are proud of. Turkish Lloyd’s class society, rina class yacht building with class approved projects and highest quality materials such as Composite, high tensile steel, Marine grade aluminium alloy, lightweight and durable materials such as carbon kevlar with superior craftmanship. Transom gulets has higher freeboards and are more spacious, the entrance to aft cabin where the master cabin is located or in some gulets the galley is accessed with stairs from the mid saloon. 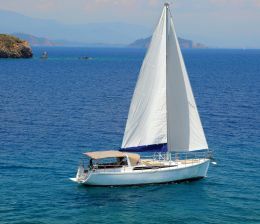 The silhouette of a sphere stern Gulet from a distance is more artistic however Transom stern Gulets are more spacious with a very efficient layout plan and interior designs. has been far more improved than ever with space age materials and unprecedended technologicall advanced materials, Radical designs and quality craftmanship with modern interiors. 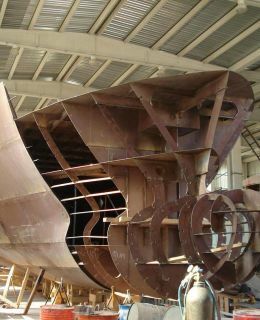 Desicion making process before commencing the project is very important, one has to decide which material is to built the motoryacht hull and certainly the model of the boat, shipyard and yacht construction engineers in order to contract the project manager. The owner should choose an experienced supervisor captain to help the yacht building engineer and to monitor shipyard progress. our yacht building experts as always, will be there for you to make sure that you have your yacht built with the highest standards and the way you wanted supporting you, before, during and after construction, including rigging, crewing, etc. Quality motoryachts deserves experienced crew such as captain, deckhands, engineer, chef and maids. Sailing yacht Building in Turkey has been improved for the last 20 years to meet the highest world standards for performance sailing. These sailing yachts are built with many different ways and different materials, such as epoxy laminated cold moulded wooden, Grp, aluminium or Hts steel. Certainly a wooden sailing yacht looks more beautiful than GRP However they are much harder and costly to maintain them in perfect shape. Nowadays many people prefer Grp, steel, aluminium or carbon cevlar hulls which are lighter, faster and needs less maintanence during wintering… We can help you build your dream yacht from very early project designing stage to boatyard installations and hull construction of your performance sailing yacht. Our children are far more nature consciense than we were ever, since the global warming is threatening our planet and the polar ice melting, we all have to be energy efficient and consume less fossil fuels in order to save our planet, well since we have nowhere else to go, we better act less selfish and more eco – friendly, right…? we all know how much fuel consumes a twin pack of 1100 HP engines of a motoryacht which can be outrageous 600 liters per hour of speed cruising when compared to a sailing Trimaran. A displacement motoryacht needs huge amount of energy to cruise gracefully in blue waters however a sailing yacht, a catamaran or a trimaran which can be as fast as a motoryacht with the right wind and let you enjoy interactive sailing with mother nature. We believe that sailing yachts are becoming more and more fuel efficient with electronic fuel disbursement pumps and are more eco friendly with ever improving technologies and lightweight hitech yacht design materials instrumenst such as carbon kevlar and epoxy bonding materials. The epoxy laminated Composite materials which are recently introduced into the yacht building industry are lightweight and resistent to wear and tear of seawater, when compared to steel, alimunium or laminated wood construction materials. The teak is still number one preference of any yacht builder for its resistence to seawater and warmth as prime material however there are alternative composite materials which is Teak lookalike and even more resistent than natural fiber of tropical forests which are under extinction… Either power yacht or a sailing yacht the hull is the most important element of a boat for long term consideration and the new advances in Yacht designing and building has reached unparalelled levels of stamina and competence, the bigger and faster the better is the main motto of many yacht building companies and the worlds leading yacht charter and brokerage houses such as Atolyacht, Barcomar, Marenostra and Stellamaris are leading the way to a more advanced fuel efficiency and lightweight Technologies. The heavy displacement mega yachts are built in with complex zero stabilizers which has improved the yachting pleasure even in rough seas and computer controlled Hydraulic powered sailing gears are now a must in modern performance sailing yachts together with highly resistant and flexible aluminium masts and rods of 316L stainless steel at its best . The new generation all in one screen navigational instrumenst become so popular that most of the circumnavigational technichs and astral navigation with sextants has become obsolete with those newly improved satellite interfaced ARPA radars, super precise Gps and multicolored 3D chartplotters are a part of Standard navigational devices and instruments which are becoming cheaper and more accessible to all even the most radical adventurer who consider circumnavigation in a bath tub.